Introduction: The current presentation, as part of author’s PhD research on the topic of “Media Arts and Human Ecosphere”, focuses on Chinese artists’ research on the theme of “Reality”. We will track back to the genesis of the research on “Reality” in China, Virtual Reality (VR) technology, with an overview on the development of “State Key Projects” at major academies and institutions. By relating different artistic projects in Second Life’s virtual platform, we will give an analysis on Chinese artists’ investigation about “Real” and “Unreal”, their search for identity and cultural roots, and their tendency to merge the real world with the virtual world by choosing to live online. Chinese artists’ investigation on “Reality” has emerged with the application of VR technology. Developing VR technology, one of the “State Key Projects” in China, became an important research target in major universities during the past ten years. In the late 1980’s, the first VR Engineering and Technology Center in China established at Northwestern Polytechnic University in Xi’an ushered in the beginning of VR technology research. In June 1990, the State Key Lab of CAD & CG in Zhejiang University successfully explored the first Chinese CAVE system. The Virtual Reality & Human Interface Technology Lab (VRHIT) of Tsinghua University applied VR technology to the analysis of human machine systems leading to improved system design and enhanced efficiency, safety, and usability of the system. Harbin Institute of Technology oriented the research on the application of VR technology in emulation tests and environmental simulation in order to improve civil aviation and military affairs in China. Beijing University of Aeronautics and Astronautics (Beihang or BUAA) recently founded the State Key Laboratory of VR Technology and System focusing on virtual reality modeling theory and methods, augmented reality and human-computer interaction mechanisms, distributed virtual reality methods and technologies, and virtual reality platform for tools and systems. Today VR technology is embedded in one’s daily life with various applications in education, leisure, tourism, urbanism, medical treatment, e-commerce, and military affairs. These “State Key Projects” in response to Chinese governmental policy of developing new technologies to advance Creative Industries and economic expansion are usually supported by stable national research funds and directed by governmental institutions and major academies. When talking, however, about VR technology research in the fine arts field, the situation is totally different. The dialogue between artists and scientists hasn’t been officially established in current China. In BUAA, one of China’s leading universities in VR technology research and nanoscience, inter-departmental exchange is almost nonexistent. 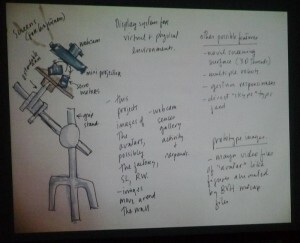 Moreover, the likelihood for BUAA to adopt the concept of combining art, science, and technology is slim. Things appear better at Tsinghua University, the sponsor of the International New Media Arts Exhibition and Symposium, the largest in China. Tsinghua’s Academy of Arts & Design recently inaugurated China’s first Art & Science Media Lab (TASML) with the support of numerous internationally recognized institutions such as Parsons New School, V2, ZKM, and Ars Electronica. Nevertheless, the project took more than two years to be approved by the University’s administration. The merger of art, science, and technology is so far for most artists in China a utopian dream. Even artists who teach in academies with access to government grants and cutting-edge equipment encounter numerous obstacles. Completed projects investigating the theme of “Reality” are quite limited. Born in 1978 in Guangzhou, Cao Fei grew up during China’s the most important ten year reform period. Her camera captures young Chinese living in contemporary China dominated by a booming economy, information overload, and evolving technologies. In 2003, when Linden Lab launched the 3D virtual world Second Life, Cao Fei became the first Chinese artist to explore the virtual world through her avatar, China Tracy [Fig 1]. Since 2007, China Tracy developed a fabulous life within Second Life that even her creator thinks is impossible to accomplish in reality. Today, China Tracy enjoys such a worldwide reputation in Second Life’s virtual world that, the opening ceremony of Cao Fei’s famous project RMB City [Fig 2] in Second Life, drew huge avatar crowds which brought Cao Fei’s Internet server to a standstill! Meanwhile, in the real world, Cao Fei travels the world showing China Tracy’s life (also her virtual life) by setting up exhibitions or multimedia performances. Cao Fei once complained that the exhibition set up is much easier in the virtual world than in the real world. By transposing every detail in real life to China Tracy (she even has a son in Second Life who has the same name as Cao Fei’s real son), Cao Fei appears to be building a real life for her avatar, making the unreal really real. 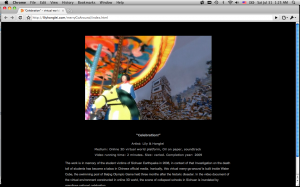 Contemporaries of Cao Fei, Beijing media artists Lily & Honglei resurrected the culture and history of their motherland in Second Life’s virtual space, while re-constituting it in a contemporary context so as to comment on the social problems in contemporary China. Behind their interest in blurring between real and unreal, is their search of identity and culture. In Lily & Honglei’s “Land of Illusion – Reconstituting History and Culture in Online Virtual World” [Fig 3] diverse social issues in contemporary China are discussed through symbolized objects and characters: the “great fire wall” symbolizing the cultural barrier, the “underwater city” a virtual recreation of a real historical site near the Three Georges Dam, where the female character roaming around the “underwater city” is the ghost of Xishi, a famous beauty in folk tales. The artists are not only appealing for the conservation of Chinese cultural heritage as the soul of the country but are also concerned about more universal themes such as religion and freedom. In episode IV “Celebration!” [Fig 4], a work in memory of the student victims the Sichuan earthquake in 2008, the year of the Olympic Games, a virtual Merry-go-around is built inside a Water Cube where the Games were held three months after the historic disaster. The entire episode is an ironic allusion of China’s official media blackout on the student death toll investigation during the period of the grandiose Olympic Games. In another newly launched project “Shan Zhai Village in Second Life”, Chinese artist Sheng Jie with her collaborator, Stephanie Rothenberg from New York City tend to attack one of the most delicate issues in China – copyrights [Fig 5]. “Shan Zhai”, or “Mountain Village” is an online term in China referring to Chinese knock-offs of brands particularly electronics. 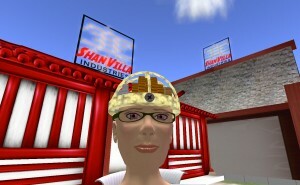 “Shan Zhai Village” in Second Life is a store where people in the real world and avatars in the virtual world are invited to exhibit and sell their imitation products [Fig 6, 7]. The products could vary from common daily life commodities to the most extravagant inventions (for instance, a reproduction of ourselves with a totally surreal look). Real people and avatars are invited to expand their imagination by breaking with conventional definitions in order to make a total paradox and ironic “Anti-Copyright virtual world” that goes in parallel with the real world. The project gained a lot of support from people in the real world during the artists’ recent market research in one of the most dynamic areas of Beijing. 98% of the people living in the area showed their strong willingness to purchase these future products when they saw their prototypes in the Second Life. Second Life is becoming the best platform for Chinese artists to investigate the potentiality of the online space for artistic creations, as well their capacity to improve their real life by making the unreal real. Besides the low production cost and the full freedom of speech, Second Life also possesses the eventual power to influence the global economic structure and financial system of our time. The on-going collaborative Mixed Reality project between Beijing based artist Fei Jun and Toronto based artists Judith Doyle and Jim Ruxton is a good example. The project “Gesture cloud, at the intersection of physical and virtual environmental spaces in Toronto and Beijing” [Fig 8, 9] aims to explore the possibility of transferring gestures projected in the real world to a virtual environment, such as Second Life, where avatars convert the gestures, through their labors, into virtual money which will be used to purchase shares of a real world company. Profits from that company will return to the originator of the gestures. The artists also planned a gallery exhibition event for which they will create a robotic arm that is in charge of collecting gestures from exhibition visitors, then transferring it into Second Life, making the interaction with the avatars’ own gestures in the virtual world. The most intriguing aspect of this project is the position of the virtual platform Second Life. The artists stated that Second Life actually was not the best virtual platform for their project. However, no other network service could meet the technical requirements of the project. When real life has to be supported by a virtual world as in the current project, the definition of real and unreal may require to be reexamined as well. Along with the development of the Internet and all online network services, living online is considered the most “efficient” lifestyle in contemporary China especially by those born after 1970. Besides the global network services such as Facebook, YouTube, Twitter, and Skype, China’s young generation also favors local products “Douban” (Bean Petal), “Sina MicroBlog”, “Taobao” (Hit in the originals) and “Kaixin” (Happiness). 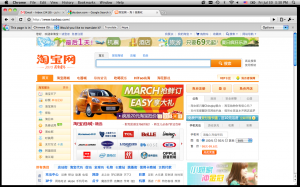 Established in March 2005, the social network service “Douban.com” [Fig 10] has over 43,030,000 users and 170,000 groups. The best way to show your dynamism as a social person in China is to set up an account on Douban, become a group administrator, and entertain your members with various activities. The fact of having thousands of fans across the country gives young people a positive understanding about society and sometimes leads them to better opportunities in life. Sina MicroBlog [Fig 11] launched in October 2009 is another local network service created on the model of Twitter. Comparing to Douban, it has the advantage of being supported by a large community of celebrities in entertainment, sport, culture and art. 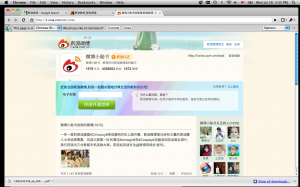 The visitors on Sina MicroBlog can access the celebrities’ blogs, interact with them or forward their notes to other bloggers. Within one year, Sina MicroBlog successfully made itself the favorite network service of young Chinese. The service is frequently used by culture and art events organizers as an original way to have an interaction between celebrities and audiences. 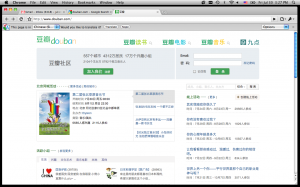 Different from Douban and Sina MicroBlog, Taobao [Fig 12] is the Chinese version of “e-Bay” minus the auction function. 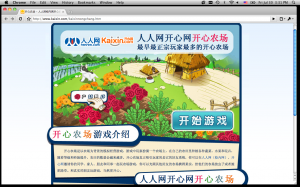 Although no longer considered as a favorite network tool by young Chinese, Kaixin which appeared in 2007 caused a sensation in China especially by its virtual game, Kaixin Farm (The Happiness Farm). Reproduced originally under the model of Facebook, Kaixin carried out a series of virtual competition games that immediately gained a huge community of young people who, after work, rushed home to get an online parking place or labor to earn a luxurious house. The most famous game, Kaixin Farm [Fig 13], was even able to keep people up at night to compete with other Netizens by stealing “vegetables” and “plants” from their farms in order to exchange them for as much money as possible in their virtual life on Kaixin. The game gained such a huge following that for several months it received major Chinese media coverage with reports on its negative effects – people couldn’t get up in the morning to attend work or school on time – which finally obligated the Chinese government to warn the company that created the game. Even with the restriction today, Kaixin still is the only Chinese virtual network service similar to Second Life although it can barely compete with it. What is real? What is unreal? Today when living online became a vivid and consequential normality that comes to transform all non-existing matters into physical materials or phenomena, the border between virtuality and reality is blurred, and the definition of “Reality” needs to be re-examined as well. Nevertheless, when elaborating the above topic within the context of China, we shouldn’t neglect the big social environment that contemporary China is providing. The market economy that greatly improved China’s economy and successfully awaked people’s consciousness for capital, appears to have also transformed the whole country into a land of fortune hunters. The recently launched “Creative Industries” policy which should have supported the art professions’ evolution in China, became in reality another means of transforming art into a product in order to stimulate the economy. Under such a social environment where fortune and power are more meaningful than one’s life itself, it actually is not surprising to see people escape to the virtual world. As Cao Fei once said in her blog: “In the virtual world, we do not need to deal with so many people getting confused within such complicated relationship networks as in the real world.” For artists living in China, relying on creations for their livelihood is challenging; for those who try to explore the blurring lines between art, science, and technology, the challenge is still tougher. Knowing how to deal with the specific Chinese policy on art and culture is already the most important art – that of survival. Taking advantage of science and technology to strengthen one’s artistic profession is definitely unreal for most of the artists still struggling in China. Statistic showed on July 28th, 2010 on Douban.com.